As you hopefully know, Return of the Cypher has become San Francisco’s premier Hip Hop weekly.. I proudly serve as a R.O.T.C. Director and I am extremely excited that our event is about to celebrate our 5 year anniversary. R.O.T.C. is your rightful home in the SF Bay Area, if you were raised by Hip Hop culture. Welcome home. We continue to operate as a FREE weekly. Come visit us Sunday nights starting at 9:00 at the Boom Boom Room in the historic Fillmore district of San Francisco. 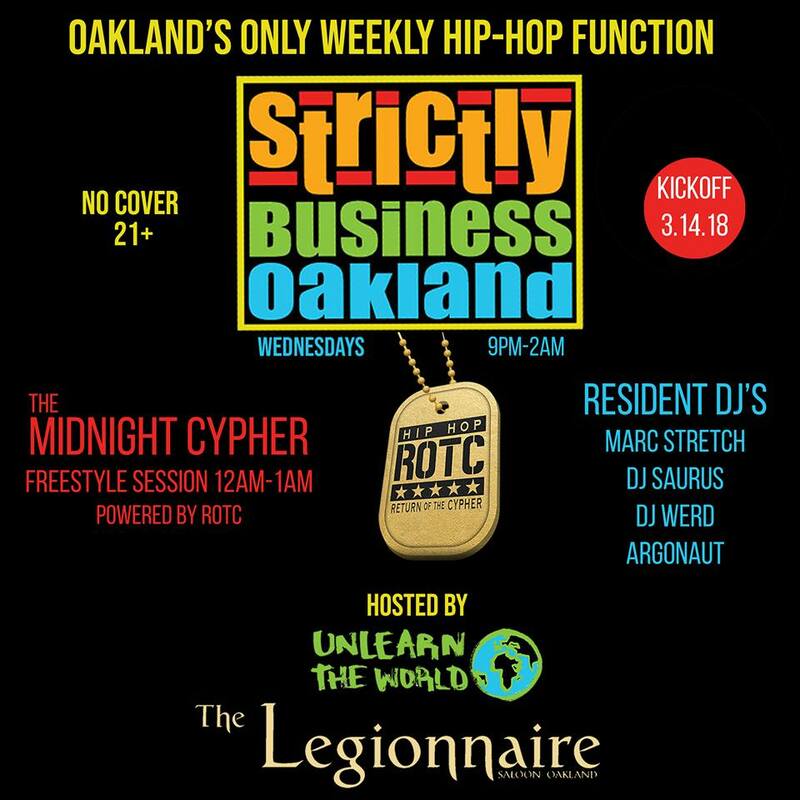 Oakland Legionnaire‘s weekly Strictly Business party will be joining forces with R.O.T.C. on a monthly basis starting on 03/14/18. Every second Wednesday from midnight to 1:00AM will feature a R.O.T.C. cypher overseen by R.O.T.C. Director Unlearn the World. Shout outs to Foreign Legion and DJ Saurus!